questions. Make your reservation directly from our website & take advantage! WHY TO CHOOSE PITEOUSSA ROOMS & CO IN HYDRA? Piteoussa rooms & co combines a perfect location, modern facilities and warm hospitality on the beautiful island of Hydra. It is located just a few meters from the harbor and the center of Hydra, giving easy access to all the sights, shops and other places of interest on the island. Our rooms are spacious, modernly decorated, while retaining the Hydra style as well as fully equipped with what you need. Our aim is to give our guests a unique hospitality experience. Make your reservation at Piteoussa Rooms & Co in Hydra! 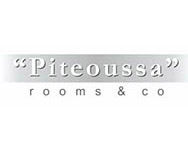 HOW CAN I MAKE A RESERVATION AT PITEOUSSA ROOMS? Book your room now at Piteoussa rooms & co via our secure online booking engine. Click on Best Online Rate, choose the dates you want and make your reservation for a unique stay experience in the center of Hydra. HOW CAN I GET TO PITEOUSSA ROOMS & CO? Our hotel Piteoussa is ideally located 200 meters from the port and the center of Hydra. Hydra can be reached either by a flying dolphin from Piraeus port or by car from Athens to Ermioni and then by taxi to the island. Find Piteoussa Rooms & Co on the map! WHAT IS CHECK-IN / OUT TIME ? The check in at Piteoussa starts at 14:00 and the check out is until 12 o'clock. See more about our services! WHAT CAN I DO DURING MY STAY IN HYDRA? Hydra is an island of unique beauty and is not mistakenly described as the "Argosaronic Jew". Whenever you plan a visit one thing is for sure: it will enchant you with the stone houses, the big mansions and the cobblestone passages. Piteoussa is located in the center of the island and will help you wander around the beautiful alleys of Hydra, discover it and explore many activities. Nature lovers can choose to hike or ride and discover paths and enchanting landscapes with incredible views. Alternatively, during the summer months, you can try diving in the blue waters of Hydra or arrange a one-day boat trip around the island. Discover the sights of Hydra! IS THERE WIFI IN THE PITEOUSSA? Of course! Wi-Fi access is available in all rooms at Piteoussa. WHICH PLACES IN HYDRA SHOULD I VISIT? Hydra is an island with unique architectural heritage. It is worthwhile to wander through its scenic slopes, discover the beautiful scenery with the stone-built houses and the large mansions. Stop at the Tombaz and Tsamadou mansions and the Cathedral, the famous Monastery. Do not forget to visit the Museum of Hydra on the left of the harbor, where invaluable treasures are kept since the 1821 revolution.